CNN is now reporting that embattled FBI former Deputy Director Andrew McCabe, who is even now dueling with ex-Director Comey over whose story is the more accurate of what actually happened, is now seeking an immunity deal, which means McCabe could be planning a massive take-down of the Shadow Government coup that has so far failed at reversing the 2016 election. It has been rumored that McCabe had much earlier indicated to sycophants that if he goes down he’s taking a great deal of the top actors [ in the Obama regime] with him. Meanwhile, one major point, in addition to the aforementioned, is the fact that the I.G. report has, in fact, been released, but to only the names mentioned in the report, which is standard practice for such things. 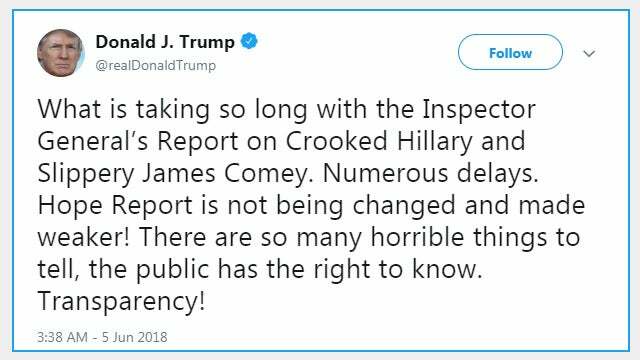 “Trump tweeted this morning, “What is taking so long with the Inspector General’s Report on Crooked Hillary and Slippery James Comey. Numerous delays. Hope Report is not being changed and made weaker! There are so many horrible things to tell, the public has the right to know. Transparency!” [sic] We’ve been hearing about the inspector general report for weeks now. It has been imminent for weeks. (For those of you in Rio Linda, “imminent” means “any moment.”) Now, what has been going on with this? By law, the inspector general report, when he finishes it, is shown to the people that are mentioned in it — and in some cases, their lawyers — at which time they are thus given ample time to prepare a defense or to lobby to have what is said about them removed. Now, since the IG report has been announced as completed and as having been circulated throughout Washington where people named in it can see how they’re named, there are two interesting things of note. A lot of people have started resigning from a lot of places. People have started resigning from the FBI. We’ve had a bunch of lawyers resign from their firms, one of them Perkins Coie. There are some others. But you know what’s really remarkable about this, Mr. Snerdley? Not a single leak. 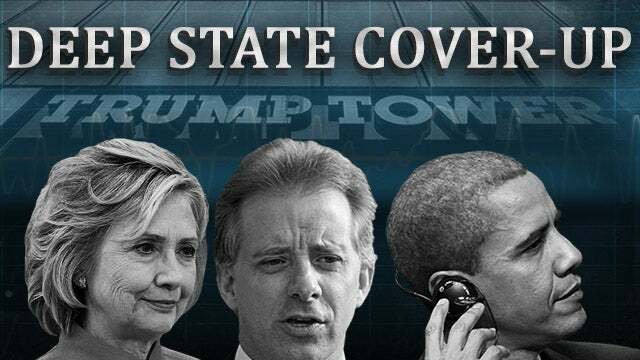 Not a… This is the first massive-size document that has anything to do with the intelligence agencies, the deep state, the Washington establishment that has not leaked. Now, the significance of that is that it must be pretty damning. It must be pretty big if nobody is leaking anything here. “Former FBI Deputy Director Andrew McCabe has requested the Senate Judiciary Committee provide him with immunity from prosecution in exchange for testifying at an upcoming congressional hearing focused on how senior officials at the FBI and Justice Department handled the investigation of Hillary Clinton’s private email server, according to a letter obtained by CNN. “Under the terms of such a grant of use immunity, no testimony or other information provided by Mr. McCabe could be used against him in a criminal case,” wrote Michael Bromwich, a lawyer for McCabe, to Senate Judiciary Chairman Chuck Grassley, who has requested McCabe testifies next week. Grassley, an Iowa Republican, has quietly requested that several former officials appear in front of the Judiciary Committee to discuss the long-awaited internal Justice Department report, which sources say will detail a series of missteps surrounding the Justice Department and FBI’s investigation into Clinton’s handling of classified information while secretary of state. The inspector general’s report has not yet been released, but Grassley has invited former FBI Director James Comey and former Attorney General Loretta Lynch to testify as well, according to those familiar with the plans. The stakes for McCabe’s appearance, however, are particularly high. The former No. 2 at the FBI is entangled in a separate criminal investigation stemming from an earlier report from the inspector general’s office that concluded he lied to internal investigators. McCabe has steadfastly denied wrongdoing, but any congressional testimony he provides could have serious implications for his criminal case. If McCabe invokes his Fifth Amendment right instead of answering certain questions, it could set up a contentious confrontation with lawmakers. They could serve him with a subpoena and if he continues to refuse to testify, lawmakers could pursue a contempt resolution against him and refer the matter for prosecution by the DC US Attorney’s Office or enforce the subpoena through civil action in federal court. Grassley wrote to the FBI Tuesday requesting that McCabe is released from a nondisclosure agreement that prevents him from providing those emails, among other records. McCabe was fired from the FBI in March less than two days shy of his retirement after rocky final months of service. During the 2016 campaign, then-Republican presidential nominee Donald Trump latched on to a report that McCabe’s wife accepted nearly $500,000 from the political action committee of then-Democratic Virginia Gov. Terry McAuliffe, a Clinton family ally, during a failed bid for state Senate in 2015. Though McCabe was not promoted to deputy director at the FBI until months after his wife lost the race, Trump continues to assert on Twitter that McCabe had a conflict of interest in later overseeing the FBI’s investigation into Clinton’s use of a private email server, given the donations to his wife. Now, we’ll begin to see how the entire debacle will take shape, this, based on the pieces that have been haphazardly cobbled together over the past 16 months. Moreover, with the very strange tones recently emanating from all the major media players in the Fake News sector, this could be epic, indeed. Rest assured, this will change the entire narrative going forward, once it fully gets out, nevermind McCabe’s testimony; and Trump will almost certainly NOT be on the receiving end.